Escape to a world of renaissance beauty at Villa Mangiacane in Firenze, Italy. 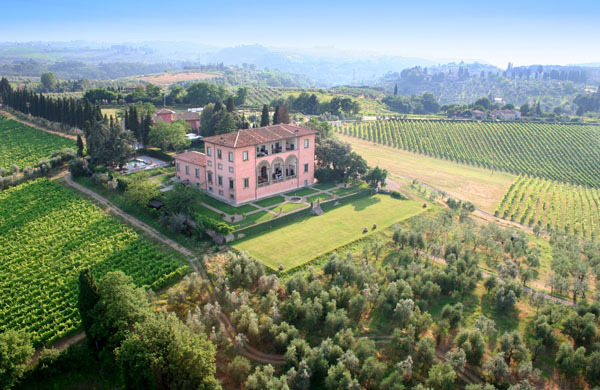 Former home to the powerful Machiavelli family and famed author of The Prince, Villa Mangiacane is a hidden gem nestled in the Chianti hills overlooking Florence. Built over 500 years ago, Villa Mangiacane’s twenty-eight luxurious guestrooms and suites are individually and elegantly designed, reflecting the serenity of the property’s surroundings. The hotel is set among 600 acres of olive groves and vineyards which enables the Estate to produce its very own distinctive olive oil and range of award-winning wines. The opulence of Mangiacane combined with its history, art, and idyllic countryside setting create the perfect backdrop for a Tuscan wedding, unforgettable holiday or exclusive rental. Luxurious facilities complement the property, including a gourmet restaurant, a stunning infinity pool, unique sculpture gardens and breathtaking views of the Dome that covers Florence’s Cathedral and Giotto’s Bell Tower. At Mangiacane, guests will experience the very best of Tuscan hospitality and the joy of modern day convenience, seamlessly combined with the splendor of the Renaissance.